Q: US President Donald Trump said on yesterday the United States was considering a big fine as part of a probe into China's alleged theft of intellectual property. What is your response? A: The spokesperson of the Commerce Ministry, which is the competent department in this issue, has already given a rather detailed response to this question. Regarding the so-called forced technology transfer issue, I must point out that there is no law in China that forces foreign investors to transfer their technology. When such transfers do occur in specific cases of business cooperation, it is purely market behavior between enterprises. There is absolutely no government meddling at all. Meanwhile, I need to stress that China will resolutely safeguard its legitimate rights and interests. Q: Secretary-General Kitack Lim of the International Maritime Organization (IMO) said in a statement that he commended those involved in the international search and rescue operations so far and China's efforts to battle the fire. Can you confirm it? A: The relevant international organizations and the media are all paying close attention to this collision accident. We've also noted that on January 15, Secretary-General Kitack Lim of the International Maritime Organization, the UN specialized agency with responsibility for the safety and security of shipping, commended those involved in the international search and rescue operations so far and in the efforts to battle the fire and contain pollution from the ship. 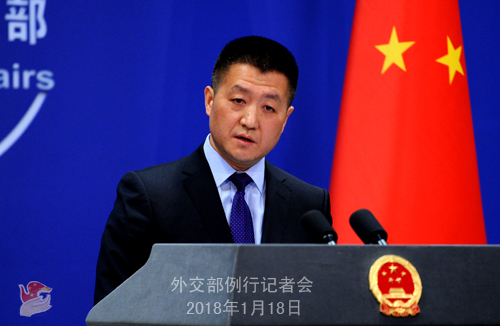 Secretary-General Lim Kitack also sent his condolences through the IMO website on January 10 to the 30 Iranian and 2 Bangladeshi seafarers still missing from the oil tanker and commended the Chinese government's search and rescue efforts against severe weather and sea conditions and the courageous acts of Chinese rescuers in battling the fire. China will remain in contact with relevant international organizations, including the IMO and inform them of the latest development. Q: Do you have any updates on the Sanchi oil tanker clean-up operation? Can you confirm how many countries are involved in the clean-up efforts and if any Bangladeshi crew members are involved? A: I advise you to check on the websites of the Transportation Ministry and the State Oceanic Administration. They will update the follow-up developments timely, including the much-watched oil slick clean-up work. Q: Representatives from the DPRK and the ROK have agreed in Panmunjom on January 17 that the two countries would march under a "unified Korea" flag at the Winter Olympics' opening ceremony and field a joint team for some matches. Besides, ROK Foreign Minister Kang Kyung-wha said that the current dialogue between the two sides could be expanded to cover the peaceful settlement of the Korean Peninsula nuclear issue, and the ROK would like to further the dialogues beyond the topic of the Winter Olympics. What is your comment? A: We have noted Foreign Minister Kang Kyung-wha's statements. In recent days, the DPRK and the ROK have been delivering good news to the international community, whether it is about cooperating on the Pyeongchang Olympics or improving bilateral ties. We get a sense of closeness between the DPRK and the ROK as members of one family. We bear witness to their reciprocal demonstration of goodwill and constructive efforts towards improving bilateral ties and ameliorating the situation on the Korean Peninsula. These efforts, as we said before, need to be encouraged. We agree that it is paramount for the DPRK and the ROK at the moment to sustain the positive momentum of positive interactions beyond the Winter Olympics, just like Foreign Minister Kang Kyung-wha said, so as to cultivate mutual trust through dialogue and accumulate consensus which will lead to a pathway out of the problem, a solution acceptable to all parties, and the realization of the denuclearization and enduring peace of the Peninsula. I must stress that the current reprieve on the Korean Peninsula does not come by easily and deserves all the more to be cherished. The international community shall seize this opportunity and be generous in its support and coordination. We need to make earnest efforts to promote peace and steer the situation on the Korean Peninsula towards the right direction so that the situation could be turned around for good. We don't need any senseless trouble-making or holding each other back, because that will cost us the chance to realize peace. Q: Some Philippine lawmakers have expressed concerns that China Telecom's entry into the Philippine market could be used to give China access to state secrets. What is your response to this? A: The Philippine government recently decided to allow China Telecom to operate in the Philippines. We believe that testifies to the increasing mutual trust between the two countries and the vast cooperation potential. The China-Philippine relations have been improving, and bilateral practical cooperation has been yielding fruitful outcomes, delivering tangible benefits to the two peoples. 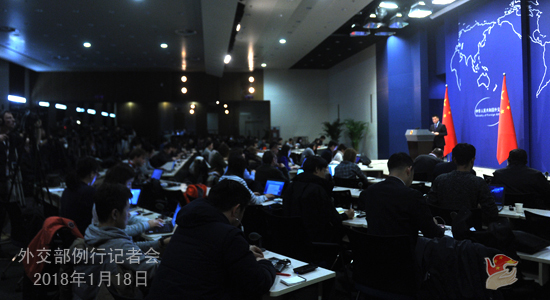 Regarding Chinese enterprises' overseas investment and cooperation, we've also said many times that the Chinese government always asks them to abide by the market principles, international rules and local laws and regulations. 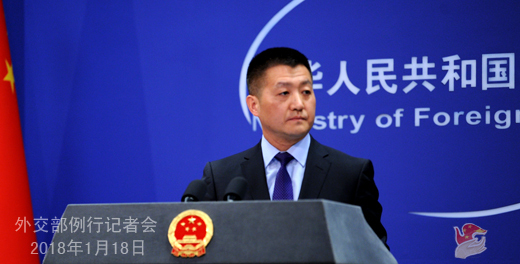 We also hope that other countries could offer necessary and amicable conditions and environment for Chinese enterprises. Q: There are reports saying that a group of US Senators are pressing the Justice Department to examine why Chinese media outlets operating in the United States have not registered as foreign agents. They have sent a letter to the Attorney General asking for the information about whether these Chinese media outlets fall under the requirement of the Foreign Agents Registration Act. What is China's comment on this? A: We know that the media connects people of different countries, facilitates their communication and enhances mutual understanding. Its role in promoting international exchanges and cooperation is becoming more prominent as new technology such as the internet is flourishing. For us, we will uphold the principle of openness, inclusiveness, and equal treatment, treat the media well and with respect, and offer them more convenience to do their job. We will not do the opposite. Q: Since China' ivory ban took effect on January 1, many African countries, wildlife protection organizations and news media have spoken highly of this measure. Could you tell us more as regards the implementation of this measure? A: We have also taken note of the relevant reports as well as the responses from African countries. At the Johannesburg Summit of the Forum of China-Africa Cooperation in 2015, China pledged to support Africa in wildlife protection and in fighting illegal trading and poaching of wildlife. We Chinese people always keep our promises. Since 2015, the Chinese government rolled out measures to suspend importing ivory carvings, hunting trophies and ivories and ivory products acquired before the coming-into-effect of the Convention on International Trade in Endangered Species of Wild Fauna and Flora. On December 31, 2017, further measures were implemented to stop the commercial processing and selling of ivories in China. So far, all of the 34 processing units and 143 retailing venues have been shut down. Such decisive measures were well acclaimed by the African countries. They believe that China's practical measures will help cut off ivory trade at its source, and will have far-reaching impacts on protecting Africa's elephant species and the eco-systems of Africa and the whole world, and contributing to the closing-down of major international ivory trade markets. I want to stress again that as a party to the Convention on International Trade in Endangered Species of Wild Fauna and Flora, China is committed to honoring its obligations. A full ban on ivory trade is another contribution we made to support the cause of wildlife protection of Africa. We stand ready to cooperate with African countries and the international community to do a better work at fighting against poaching and illegal trading in wildlife.